Get affordable Security Camera Installation on Irwindale, CA and CCTV equipment with commercial quality and 2 years warranty. We have been working on Irwindale, CA, since 2005. In order to provide you a free estimate we need to visit your home or business. We cannot tell you exactly where to position your security cameras, or what kind of camera do you need without knowing your property. Once we visit your property we can advise you on the best place to site your cameras. We’ll make sure that we cover the areas that you need to be covered, or can be targeted by criminals. If you are in a low budget, consider to add to your security camera system some dummy cameras; this will help deter vandals and thieves. 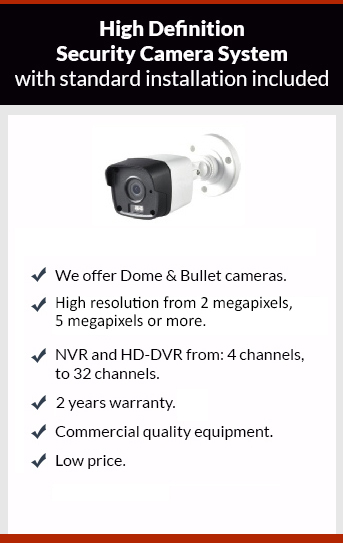 We have the perfect security camera solution for you. Give us a call to book your appointment to get your free estimate.